We received a batch of astounding numbers in this week’s COT report for not only silver, but also for gold. Guess what? 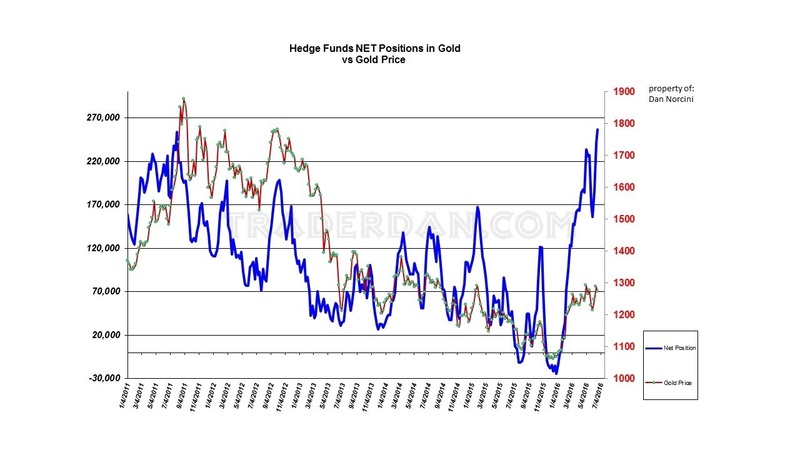 Hedge funds are at a new all-time high on the long side exposure of gold. Notice how they have blown past the former peak made all the way back in 2011. Against that, the Swap Dealers have extended their already record high Net Short position even further this week. Those are the NET POSITIONS. Take a look at the OUTRIGHT POSITIONS of the hedge funds. Here is a look at the positioning of the big players on a percentage of the total interest basis. And finally, a look at the total open interest including the spreads. 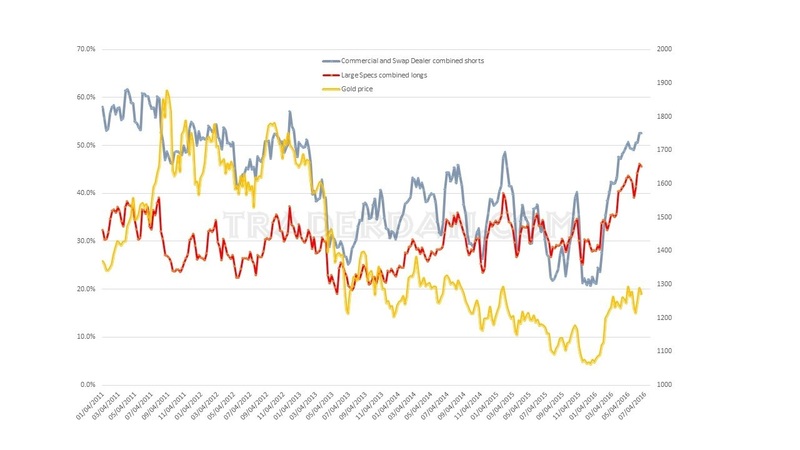 As you can see, even though the hedge funds are holding a record long side exposure to gold, the total open interest remains well below the previous record set back in 2011. The difference is coming from the number of spreads. Back at that former peak in 2011, the number of spreads hit an all-time high as well when a 473,000 number was recorded. This past week, they hit 298,000. We simply have less spreaders operating in gold at this time. While the hedge fund long position is quite massive, I am not as bothered by it as I otherwise would be under normal circumstances. However, these are not normal circumstances. Back in 2011, we were dealing with what many were fearing was going to be a free fall in the US Dollar Index which was down near 73 and the various commodity indices had come a long way off their 2008 low associated with the outbreak of the now infamous CREDIT CRISIS. It was fear of inflation in response to the weak US Dollar associated with the Fed’s QE program that was leading investors to buy all things tangible. Today, we are dealing with NEGATIVE INTEREST RATES in some countries and falling interest rates in others, a major geopolitical event in the form of the Brexit vote – the first such break in a near 40 year relationship, an upcoming election here in the US in which both candidates are extremely unpopular, and a general feeling that Central Bank policy is proving to be ineffective when attempting to counter the deflationary forces which show no signs of going quietly into the night. 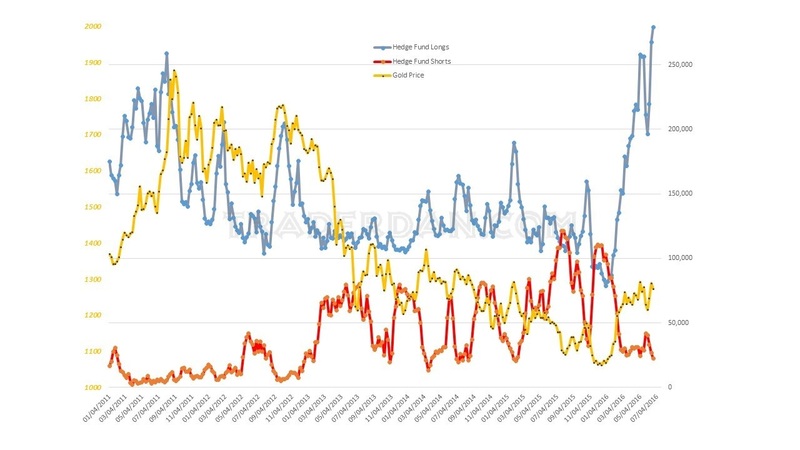 Should traders be alert due to this largely lopsided hedge fund positioning? Sure they should as they should at any time such an imbalance occurs but we have never been in a situation quite like this in monetary history and that means that it is not unexpected to see records being set in gold when it comes to speculative demand. Gold is not just moving as some sort of “anti-Dollar” as it is prone to normally do. The US Dollar index is sitting up above 95 and yet gold is moving up alongside of it. That tells us that gold is functioning as a currency in its own right and truly is acting as a safe haven at the moment. The uncertainty, confusion, the lack of conviction about how all of this is going to play out, is keeping a strong bid from investors who are getting nervous about all these things coming together. Under such circumstances, the imbalance that exists in the futures arena is not as terrifying as it might otherwise be. Traders should therefore continue to monitor the price chart for any sign of a breach of a support level and be ready to lighten up on their position if such occurs but at the same time, they should be looking for dip buyers to emerge. While anything is possible in a market, it is difficult to conceive of a mass exodus out of a safe haven in the current environment unless we get some sort of stunningly strong economic data out of somewhere. Right now, that simply does not seem to be in the cards. 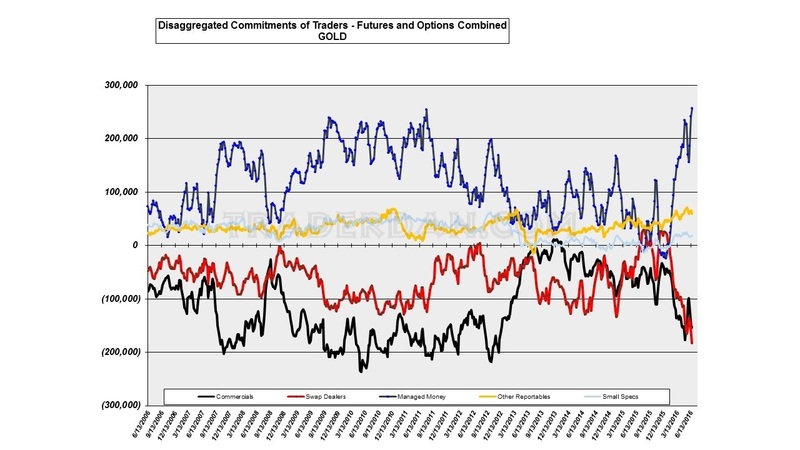 Stay vigilant, do not grow complacent but do not blindly exit out of long gold positions merely because the imbalance exists in the COT report. Remember, it can grow even bigger yet. Now that gold has cleared $1300 so convincingly on the weekly chart, it is actually conducive to further gains from a pure TA perspective as that was a major overhead resistance zone. Let’s see if we get some more upside follow through during the course of this upcoming week.